[162 Pages Report] Cognitive analytics enables business users to apply human-like intelligence to various tasks, such as identifying context from the text, audio, and image. It utilizes varied advanced technologies including Artificial Intelligence (AI), machine learning, and Natural Language Processing (NLP). The cognitive analytics market size accounted for USD 1.62 Billion in 2016 and is projected to reach USD 10.95 Billion by 2022, at a Compound Annual Growth Rate (CAGR) of 42.9% during the forecast period. For the report, 2016 is considered to be the base year while the forecast period under consideration is 2017–2022. The research methodology used to estimate and forecast the cognitive analytics market began with capturing the data on key vendor’s revenues through secondary research sources, such as company websites, Factiva, and D&B Hoovers. The other secondary sources included annual reports, press releases, and investor presentations of companies; white papers and certified publications; and articles from recognized authors, directories, and databases. The vendor offerings were also taken into consideration to determine the market segmentation. The bottom-up procedure was employed to arrive at the overall market size of the global cognitive analytics market from the revenue of the key players in the market. After arriving at the overall market size, the total market was split into several segments and subsegments, which were then verified through primary research by conducting extensive interviews with the key people, such as Chief Executive Officers (CEOs), Vice Presidents (VPs), directors, and executives. The data triangulation and market breakdown procedures were employed to complete the overall market engineering process and arrive at the exact statistics for all the segments and subsegments. The breakdown of profiles of primary is depicted in the below figure. The cognitive analytics market comprises several vendors, such as IBM (US), Amazon Web Services (US), Google (US), Microsoft (US), Oracle (US), SAS Institute (US), Intel (US), Cisco Systems (US), HPE (US), Nuance Communications (US), IPsoft (US), Narrative Science (US), Nokia (Finland), Sinequa (France), and Persado (US). The other stakeholders of the cognitive analytics market include analytics service providers, consulting service providers, Information Technology (IT) service providers, resellers, enterprise users, and technology providers. These Cognitive Analytics Solutions Vendors are rated and listed by us on the basis of product quality, reliability, and their business strategy. Please visit 360Quadrants to see the vendor listing of Cognitive Analytics Solutions. The study answers several questions for the stakeholders, primarily which market segments to focus on, in the next 2 to 5 years for prioritizing the efforts and investments. 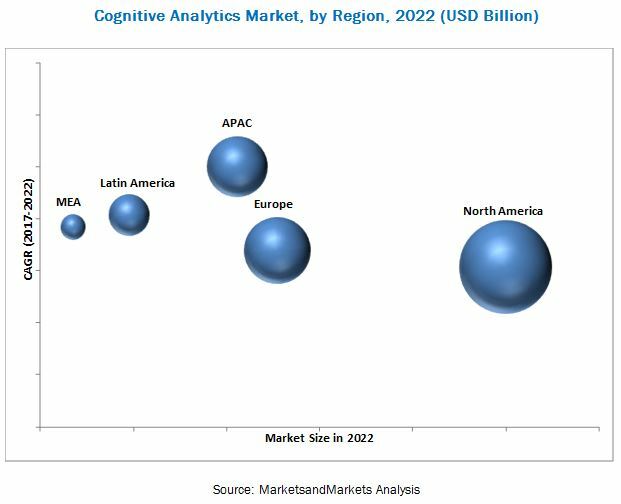 The cognitive analytics market is expected to grow from USD 1.84 Billion in 2017 to USD 10.95 Billion by 2022, at a Compound Annual Growth Rate (CAGR) of 42.9% during the forecast period. The major growth drivers of the market include the rise in the adoption of the cognitive computing technology, the proliferation of data, and the introduction of advanced analytics techniques, which are fueling the demand for effective cognitive analytics solutions. However, the lack of trust in technology and complex analytical processes are expected to limit the growth opportunities for proprietary solution vendors in the market. The cognitive analytics market also faces some challenges, such as the lack of skilled workforce, and data quality and security issues. The cognitive analytics market is segmented by component into tools and service. The services segment is expected to grow at a higher CAGR during the forecast period. Among the services, the managed services segment is projected to witness a higher CAGR, due to the increasing demand for outsourced cognitive analytics services. The healthcare and life sciences industry is estimated to have the largest share of the cognitive analytics market in 2017. Cognitive analytics enables organizations in the healthcare and life sciences industry to accelerate scientific discoveries, transform clinical trials, and improve the execution and engagement for better treatment and care management, leading to the high adoption of the technology in this industry. The major applications of cognitive analytics include asset maintenance, fraud and risk management, customer analysis and personalization, sales and marketing management, supply chain management, and others (network management and workforce management). The fraud and risk management application is expected to grow at the highest CAGR during the forecast period. The cognitive analytics market is expected to grow in the fraud and risk management application, as it helps companies analyze and clarify ambiguous and uncertain data, and find the known and unknown risk indicators. Companies in both public and private sectors are using large volumes of data both internally as well as externally. Therefore, they experience the need to adopt a preventive risk management approach. By combining the data processing ability with learning capabilities, the cognitive systems can detect deep hidden anomalies and patterns, which are almost impossible to detect with the traditional approaches. Organizations are deploying cognitive analytics solutions, either on-premises or on-demand (cloud). The demand for cloud-based cognitive analytics solutions is expected to grow at a higher rate. Due to the scalability and agility of cloud-based technologies, more enterprises are proactively adopting cloud-based cognitive analytics solutions to avail the cost-saving benefits and increase their operational efficiency. On the basis of regions, the global cognitive analytics market has been segmented into North America, Europe, Asia Pacific (APAC), Latin America, and Middle East and Africa (MEA). The North American region, followed by Europe, is expected to be the largest revenue generating region for cognitive analytics vendors, for the next 5 years. This is mainly due to high adoption of advanced technological solutions and increasing focus on innovations through Research and Development (R&D). The APAC region is expected to be the fastest growing region in the cognitive analytics market, due to factors such as rapid economic developments, globalization, foreign direct investments, digitalization, and increased adoption of high-end technologies across major APAC countries. The major vendors that offer cognitive analytics tools and services globally are Amazon Web Services (US), Google (US), IBM (US), Intel (US), Microsoft (US), Oracle (US), SAS Institute (US), HPE (US), Nuance Communications (US), IPsoft (US), Narrative Science (US), Cisco Systems (US), Nokia (Finland), Persado (US), and Sinequa (France). These vendors have adopted different types of organic and inorganic growth strategies, such as new product launches, product developments, partnerships and collaborations, and mergers and acquisitions, to expand their offerings in the cognitive analytics market.